Make the 2019 1 Kilo Australian Kookaburra the star of your silver coin collection with coininvest.com. Struck from a full kilogram of fine .9999 silver and featuring the stunning new 2019 design, this superbly crafted coin is sure to be in demand. It's a great choice for investors too; the Australian Kookaburra is the Perth Mint's longest running series and the 2019 Kookaburra will be the first of its coins to carry the new obverse portrait of HM Queen Elizabeth II. Launched in 1990, the Perth Mint's Australian Kookaburra has captured the imaginations of numismatists around the world. Thanks to its purity and an annually changing reverse design featuring the kookaburra, the series continues to appeal to both investors and collectors. The kookaburra is the largest member of the kingfisher family and it's one of Australia's most iconic birds. It can be found in woodland areas all over the country and is recognised from its cry which resembles raucous laughter. For the 2019 1 Kilo Australian Silver Kookaburra, the mint's artists have created a fabulously detailed image of a kookaburra at sunset. As the sun sinks below the rippling waters, the bird perches majestically on a semi-submerged tree trunk. It's the ideal complement to the coin's new obverse design – the famous 'fifth' portrait of HM Queen Elizabeth II by Royal Mint artist Jody Clark. This is the most up to date coinage portrait and replaces the much-loved Sir Ian Rank-Broadley design. 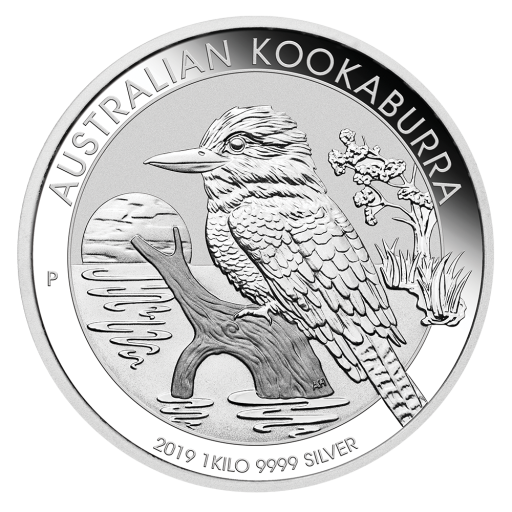 Why choose the 2019 1 Kilo Australian Kookaburra silver coin? Silver is considered one of the safest precious metals for investment purposes and, when it's packaged as an iconic 1 kilogram coin like the 2019 Australian Kookaburra, it's sure to increase in value over the coming years. Order your 2019 1 Kilo Australian Kookaburra silver coins with coininvest.com for fast, insured shipping. Coins are shipped in plastic capsules or as cards of ten. However, it's well worth adding one of our custom designed display cases to your order to protect your magnificent one kilo coin and show it to its best advantage.